A few years ago when the Smithsonian American Art Museum considered buying this painting, called The Sick Child by J. Bond Francisco, some people thought the subject was just too sentimental, too Victorian and schmaltzy. We acquired it anyway because in the early 20th century, it was one of the most famous American paintings anywhere. The artist kept it in his studio until he died, in 1931, but thousands of reproductions had been made of it and displayed in doctors' offices all across the country. The Sick Child was familiar to every parent who ever had a desperately ill child. And that was pretty much everyone. In the 19th century, most parents had the upsetting experience of watching all night long by the bed of a child flushed with fever, unsure what tomorrow would bring. Thanks to antibiotics, most parents don't have this experience anymore. In this picture, the artist leaves us in doubt about whether the feverish boy will survive or not. He looks ruddy, but that's probably just the high fever. 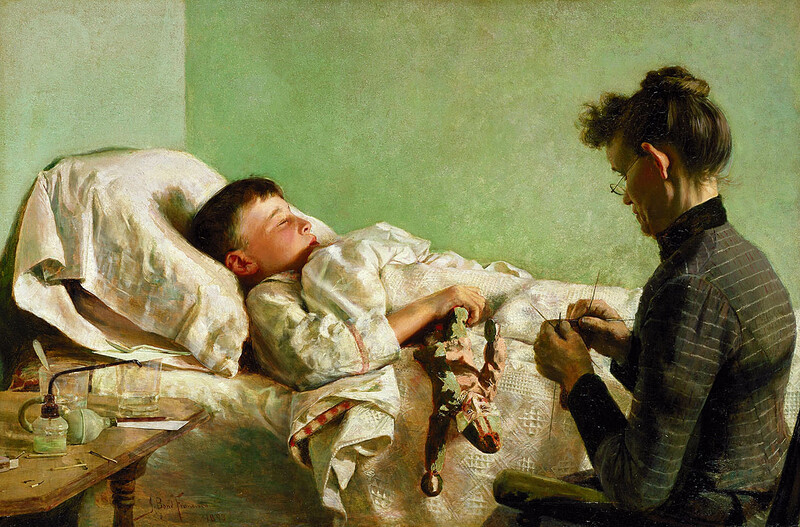 The title only says that the boy is sick; decades later, the painting was called The Convalescent, but the artist didn't give it that title, and it certainly takes the suspense out of this subject. What can we tell about how this situation will turn out?